Visitors from the Royal Institute of Nursing Kamalpreet Kaur, Parminder Singh, Sukhmanpreet Kaur, and their teacher Rajwant Bajwa, in one of the human patient simulator labs at the School of Nursing. For the first time since an agreement was signed five years ago, students from India are participating in an exchange program with the School of Nursing at UBC’s Okanagan campus. The visitors are from the Royal Institute of Nursing (RIN)—a school located in Batala, in the Punjab State, Northern India, about an hour away from Amritsar. 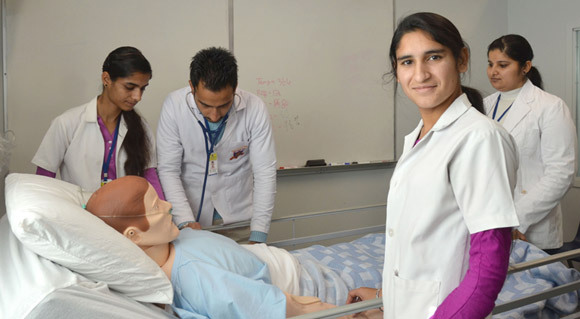 Students Kamalpreet Kaur and Sukhmanpreet Kaur are in their final year of the three-year General Nursing and Midwifery program, while Parminder Singh is in his second year of the Bachelor of Science in Nursing program. They and their vice-principal Rajwant Kaur Bajwa are in Canada for about six weeks. Through a partnership agreement between the School of Nursing and the Global Education and Charitable Trust, which operates RIN, nursing faculty from UBC visit India for a five-week period each year. Last year, Assoc. Professor of Nursing Deborah McCullough and fellow faculty member Louise McIntosh travelled to Batala and worked with the staff and students from RIN to organize a geriatric nursing seminar for all students, teachers, and nurses in the area. In previous years, UBC faculty have organized health fairs for residents in remote villages. McCullough stresses the partnership is about sharing ideas to improve health care, especially for those living in remote areas. The Global Education and Charitable Trust is run by four brothers originally from Batala. The brothers wanted to establish a nursing school to support their community in India, and to do that they needed a partnership with a university. They chose UBC’s Okanagan School of Nursing because of its reputation for delivering an outstanding nursing curriculum. “Weare very excited to have the students with us in the Okanagan this year,” says Assoc. Prof. of Nursing Barbara Brown-McKenzie, noting that while the two institutions have had an agreement since 2008, this is the first year students have made the trip to Canada. So far, the visiting students and their teacher have sat in on nursing lectures, participated in seminars, student presentations, clinical labs, and simulations. They have visited a number of practical settings including UBC Okanagan’s Health Centre, and hospitals in Vernon, Kelowna, Penticton and Oliver. “We’ve also taken them to some community practice sites such as the hospice, Cottonwood Care Centre, Vernon Community Care, and other types of care facilities,” says McCullough. The focus is not to compare the differences between health care in the two countries, but to exchange ideas and methodology, says Bajwa, noting that while they have similar labs in India, they really liked the modern, multi-function Human Patient Simulator labs at the UBC campus in Kelowna. McCullough says it has been a whirlwind trip between the academic and clinical experiences and opportunities for local social and tourism activities. Along with a day at Big White, the group also participated in a St. Patrick’s Day Celtic Concert, World Water Day, and International Fashion Week. Before they leave Canada they will visit Vancouver and spend a few days enjoying the sights of that city. Brown-McKenzie says a reciprocal visit to India next year for some UBC Okanagan nursing students is in the works.